Today we explored the amazing complex that Herod the Great built around the Temple in Jerusalem which formed the heart of the spiritual life of Israel and the primary setting of Jesus' ministry in Jerusalem. We started by exploring the extensive Temple Mount excavations along the southern end of the western retaining wall which Herod built to support the huge courtyard he built around the Temple. It was amazing to walk on the actual paving stone of the first century street and know that this was the actual street Jesus and the disciples would have used on the way to and from the Temple! Next we took a guided tour of the fascinating tunnel the Israelis have dug along the full length of the Herodian wall north of the famous Western Wall plaza. We saw how the successive occupants of this part of the city built an extensive series of huge arches to bring their homes and buildings up to the level of the Temple Mount, thus obscuring most of the Western Wall. After the tunnel we had a private virtual tour of the Temple from Jesus' time using a cutting edge digital model of the Temple with breathtaking detail and accuracy. It put us right in the Temple complex as it looked 2,000 years ago! Then we visited the southern end of the Temple Mount, again walking on the very steps Jesus and the disciples would have taken every time they went up and down from the Temple. Continuing along the southern wall we saw both the Double Gates and the Triple Gates along with the many "mikvoth," ancient Jewish ritual baths. Before a worshiper could go into the Temple Courts and make an offering, they were required to purify themselves by immersing in water, the precursor to our practice of Baptism. We found a great little place for lunch before heading back out for a visit to the top of the Temple Mount. This area was destroyed by the Romans in AD 70, left desolate by the Byzantines in the fourth century, and then developed into a Muslim religious complex by the Muslims in the seventh century. Since both Jews and Muslims claim this as one of the holiest places in the world, it is a very contentious spot and subject to lots of security restrictions. After waiting in a long security line, we manged to make it to the top and enjoyed about 45 minutes of exploring this amazing place. 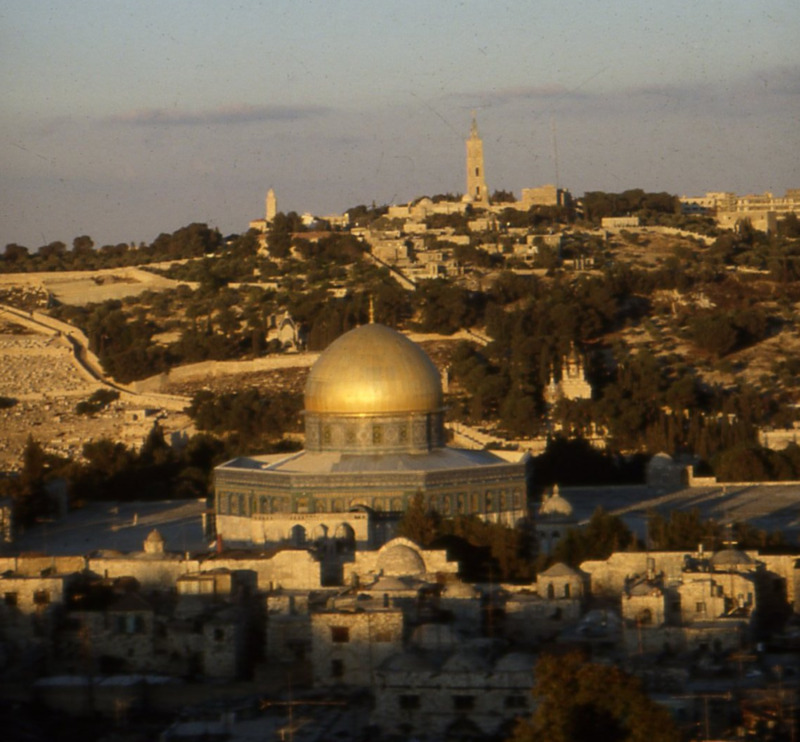 The main features of the Temple Mount, or Haram es Sharif as Muslims call it, are the two large mosques which dominate the Jerusalem skyline. The golden Dome of the Rock is the most famous and, not surprisingly, it is built over a huge rock which forms the peak of this mountain, called Zion and Moriah by the Jews. This rock was the threshing floor of Aruna which King David bought around 1000 BC and formed the floor of the Holy of Holies in the first Temple which David's son Solomon built here. As if all this weren't enough, most of us continued on to the City of David, south of the Temple Mount, and explored the ancient water system built by the Jebusites and King Hezekiah. We waded through the cool waters of the Gihon Spring which flows through a half mile long narrow tunnel which King Hezekiah had dug to bring water inside the city walls when facing an Assyrian siege. This water flows out of that tunnel into the Pool of Siloam. The pool from Jesus' time has recently been discovered and we had a chance to sit on its steps and read John's account of Jesus healing a blind man by sending him to wash in this very place! On our way back from the Pool of Siloam, we took some different routes. Some of us took the long way back and walked up the Hinnom Valley where we passed The Potter's Field, traditional site of Judas suicide and burial. We convinced a Greek nun to give us access to the monastery grounds where we were able to investigate a complex of tombs from just before the time of Jesus. It was a foreshadowing of the tomb we will be visiting in two days which was only inhabited for three days!